The H3 follows the sample principle of using fluid in a capillary tube to tell the hours but in a straight line as opposed to the circular tube of the past. 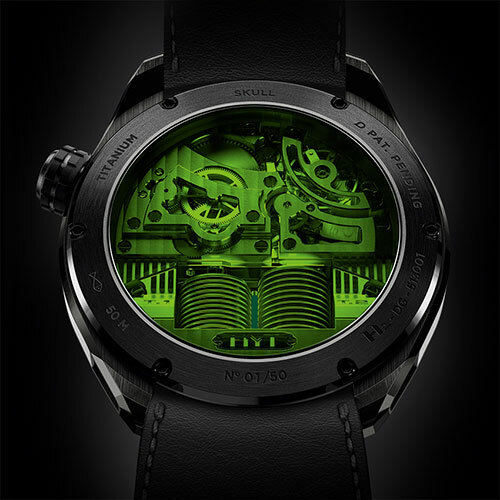 It also has a rotating four-sided hour marker positioned alongside the tube that roates every six hours to match the movement of the fluid. 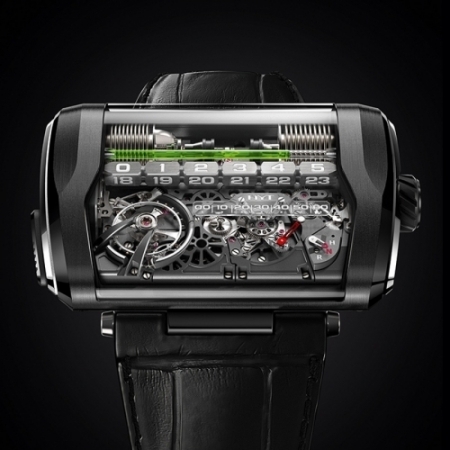 Minutes are also counted on a linear display by an articulated, retrograde double arm that sweeps a scale. 25-piece limited series. 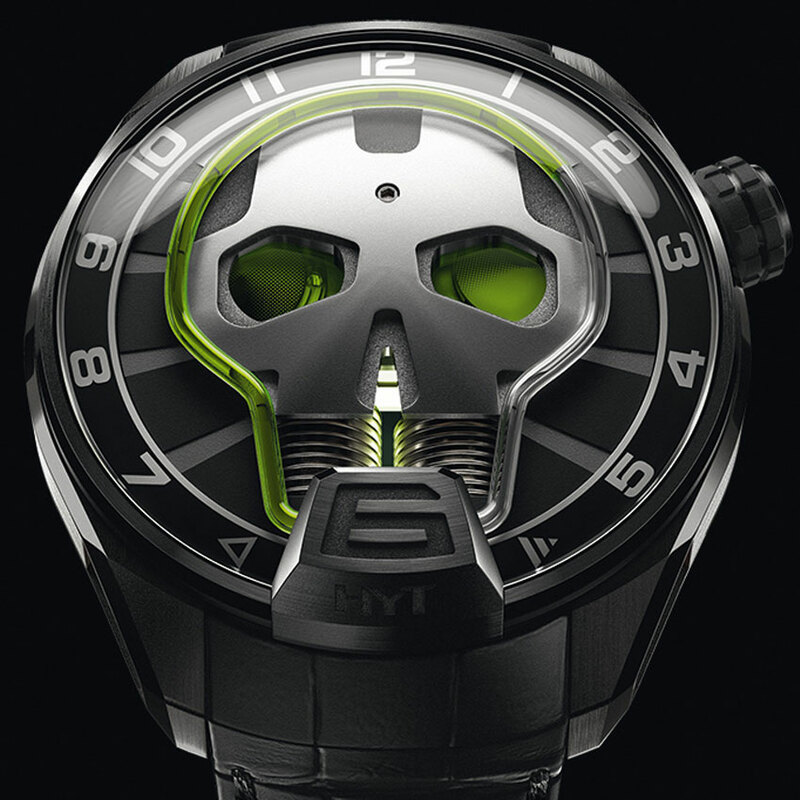 The second weapon in HYT’s arsenal is the Skull Eye that comes in both Green and Red and is limited to just 50 pieces. 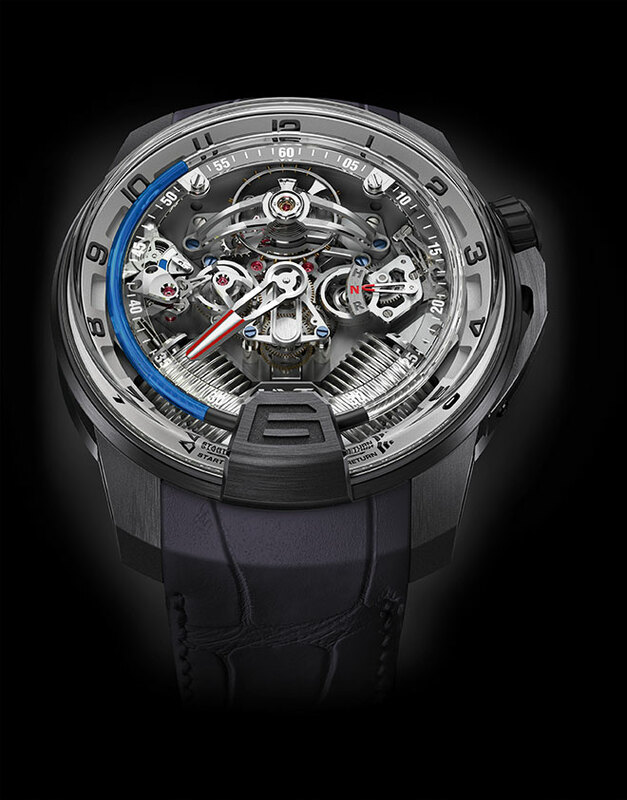 This is how it works – The right eye becomes gradually darker as the 65 hours of power reserve go by to tell you how much power you have left. The left eye has a continually rotating seconds dial and no minutes. 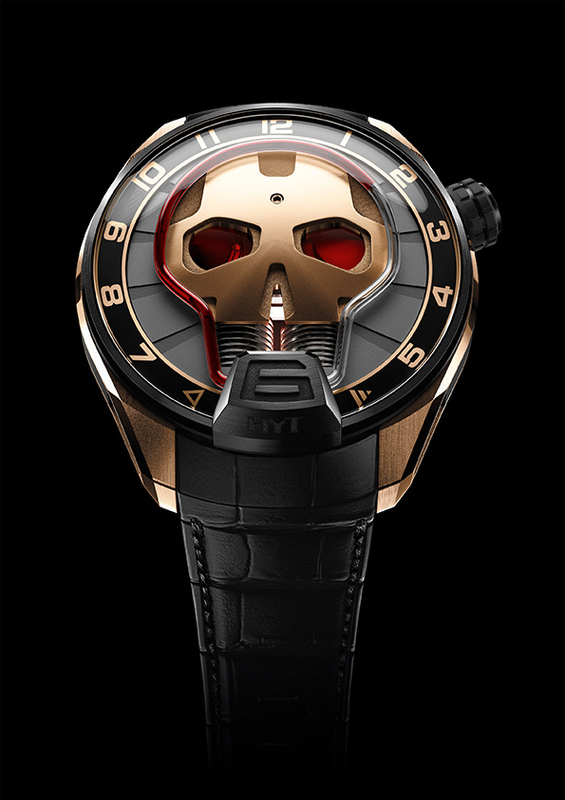 The tube that frames the skull tells you the hours. 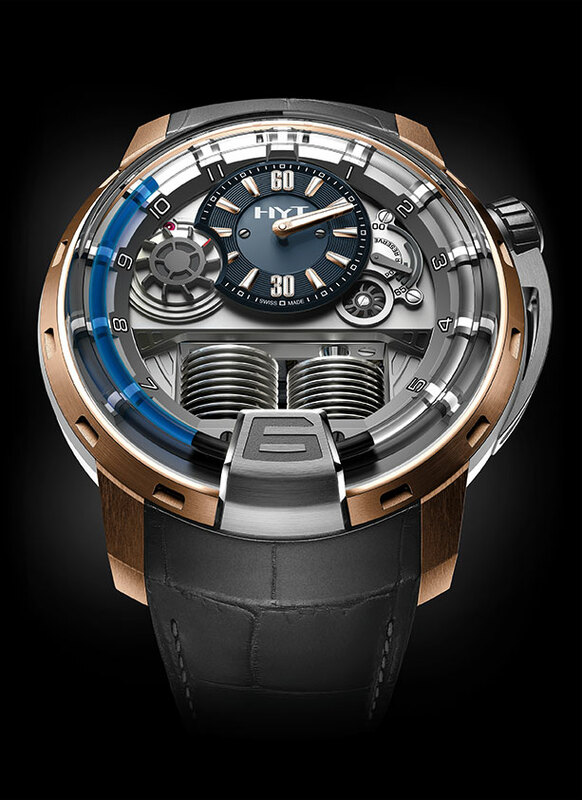 For more than two years, HYT has worked together to create a material able to integrate external elements chosen by future owners. “The real challenge was to develop an alloy whose chemical structure we could alter by adding solid, foreign elements to its basic formula, without affecting either its reliability or technical properties, such as hardness, density or brilliance”, explained Vincent Perriard, the CEO. “Our knowledge of fluid technology, in conjunction with the right partner, allowed us to achieve this goal.”. 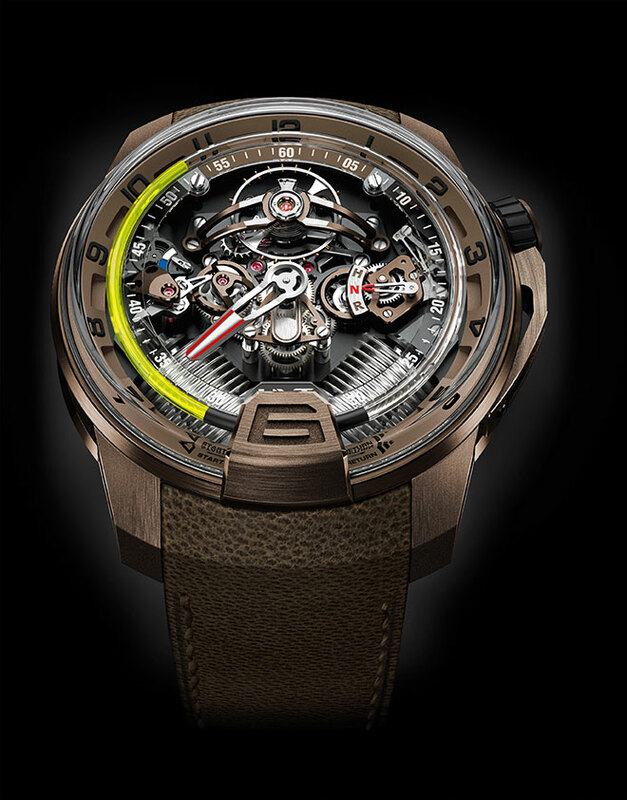 Owners therefore can, under certain technical conditions, incorporate solid elements in their HYT, for example, are you a cigar lover? 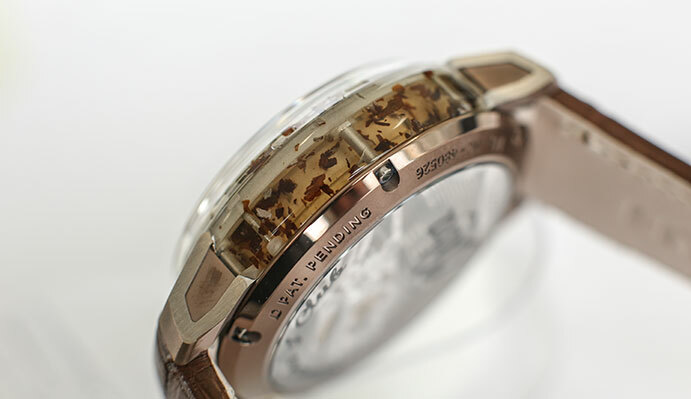 Then the H1′s case can be adorned with cigar leaves. or maybe you may want to use sand from the beaches of your island? You can see how this service is for a particular few customers. And finally two additional colors in the original H1 series that are limited to just 15 pieces each. 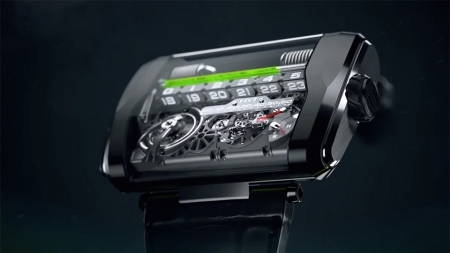 WOW how friggen cool are these watches. And here i was thinking my Pebble was the best watch out. These are absolutely stunning. :O want them all.